The benefits of open data and transparency are uniquely visible within the entrepreneurial world. Data is what fuels innovators’ work; the more data available for them to use, the easier it is for them to create new tools, apps, projects, and programs, all of which can be geared towards boosting entrepreneurship. With this in mind, it is important for us to promote the idea that fusing the two – open data and entrepreneurship – will result in more positive, impactful results, and right now, the Presidential Innovation Fellows (PIF) program is doing a great job combining the best of both worlds. The White House PIF program pairs top innovators from non-profits, academia, and the private sector with top innovators in government to develop solutions that can save lives, increase effectiveness, and drive job creation. Each fellow is a part of the program for 6-13 months, working with the government on specific projects ranging from disaster response and recovery to cyber-physical systems to open data for development, and more. This year, fourteen fellows are working on open data initiatives across the federal government with three focusing on global development. Erin Maneri Akred, working with the Department of Agriculture (USDA), is a data and analytics specialist who most recently worked at Accenture Technology Labs where she led efforts to build analytical capabilities used in healthcare applications. Vidya Spandana, working with the Millennium Challenge Corporation (MCC), is a paradigm example of an entrepreneur who made her business enterprise successful with open data; as a college undergraduate she co-founded the govtech startup DMV.org, a web platform that provides about 110 million Americans with government data and information. And USAID’s Rob Baker, on leave from his role as Operations Manager at Ushahidi and before that a developer at Oxfam, has founded and configured a free and open source platform to host and share data that can be used by any federal agency, and others. The fellows work with innovators in government to lead open data initiatives to get government open and host challenges and events to engage other entrepreneurs. These include the Food Security Open Data Challenge, Global Development Data Jam, and most recently, the Open Data TechCamp held in London and organized in partnership with Department of State, USAID, Ernst&Young, USDA, and MCC. 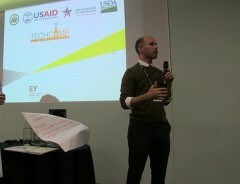 The TechCamp connected civil society organizations from around the world with new and emerging technology resources, and provided a forum for the PIFs to connect with entrepreneurs and government officials passionate about using open data for global development. 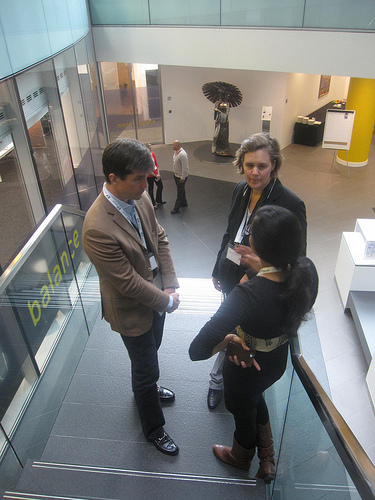 USDA and MCC’s Presidential Innovation Fellows Erin Maneri Akred and Vidya Spandana consult with Eric Nelson, Director of the Department of State’s Office of eDiplomacy. The question that USAID and other development agencies are asking is how can open data relevant to development be made more accessible, useable, and knowable to entrepreneurs that can build out their organizations for their own development solutions? Spandana provides the example of one project in Botswana that uses a mobile SMS tracking system to keep track of Rhino poachers. Because Botswana’s economy is so dependent on tourism and natural resources, poaching has become a huge problem, especially for those entrepreneurs and people whose businesses rely on those sectors in order to thrive. Thus, those involved in the project were inspired to use open data to map out where poachers might be in an attempt to reduce poaching from occurring. The goal of the PIF program’s open data initiatives is to show why data is impactful – not only for entrepreneurs but for others as well – and make sure users are aware of its benefits. Click here to learn more the PIFs program, and if you’d like more information about the PIFs program and future rounds, feel free to send your inquiries here. Follow @WhiteHouseOSTP to get the latest news and updates.